Fill the air with music! 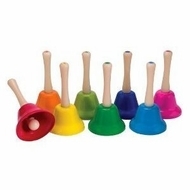 Each of these 8 beautiful colored metal bells has a plastic handle and a different musical tone. Comes with music.